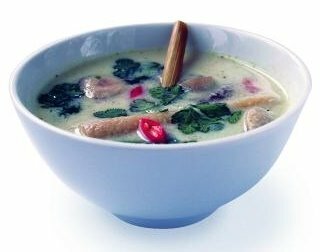 Your favorite vegetarian Thai meals are Tom Kha Hed. This menu for vegetarian and most famous of Thailand, it’s easy for cooking and delicious. Moreover, it no fat. And then use in period Kin Jay festival. That is good idea for Vegan. 1.Clean and wash the mushrooms and cut in half. 2.Wash cabbage and tomato and cut into bite sized chunks. 3.Place the coconut milk in a pot over medium heat and bring to a boil, while stirring constantly. 4.Add the galangal, lemon grass, torn kaffir leaves and boil for a minute. 5.Add cabbage, mushrooms and tomato, and use salt, sugar and the chili to season to taste. 6.Before serving hot, sprinkle with coriander. 7.Add the crisp fried chilies or crushed fresh chilies and sprinkle with chopped spring onion. 8.Serve the Tom Kha Hed hot. Enjoy eating for your cooking.